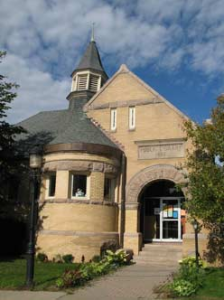 The Calais Free Library is located on the site of the home of the Hon. 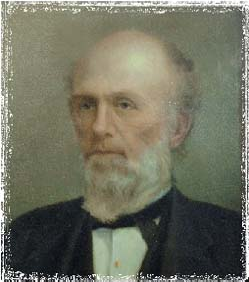 James Shepherd Pike, friend of Abraham Lincoln and associate of the New York Tribune. Pike, a prominent abolitionist, served as U.S. Ambassador to the Netherlands under President Lincoln. He made a bequest of his homestead property and also added a sum of money for the establishment of a public library in Calais, Maine. Frederick A. Pike and Freeman H. Todd also each gave a sum of $5,000 towards the building of a new library. The yellow brick building, designed by A.H. Vinal, was constructed at the cost of slightly over $10,000 and was first opened to the public on July 4, 1893. Vinal was greatly influenced by the architectural style of Henry H. Richardson, designer of Boston’s famed Trinity Church. In 1985 a large addition, which doubled the size of the library, was added in the back of the original building. There is a connector, which is also now the main entrance, between the old and new sections. The addition was carefully planned to mirror the architectural style of the original building.